"Theater audiences of the time in Rome were teased by the actors for talking, showing up late, and having a short attention span (also for lusting after prostitutes, cheating on their spouses and being old and smelly)." —Matt Walker in his Director's Note. Want to know what's worse than throwing a house party and having nobody show up? How about throwing a haunted house party and being forced to keep the level of raucousness at a level that cast members correctly concede is "about the sound of a shower?" Try getting all goofy, zany and profane in a venue where your audience is instructed — I kid you not — to "keep noise to a minimum while enjoying the production refrain from unnecessarily loud or prolonged applause, shouting, whistling, or any other intrusive conduct during the performance." That kind of decorum may work for Pinter. 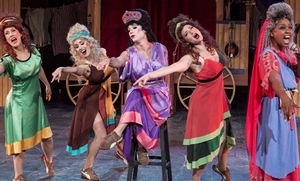 It does not fly with a Plautus comedy like Mostellaria, and it most certainly does not fly for anything produced by the Troubadour Theater Company for whom every stage appearance is an occasion for performers and audience alike to get free-wheeling, crazy. . . and yes, usually, loud. Haunted House Party: a Roman Comedy, on stage at the outdoor Barbara and Lawrence Fleishman Theater at the Getty Villa, is the Getty-produced annual staging of a work with ancient Greek or Roman origins. Plautus certainly fits the bill. His work is the inspiration for Sondheim's A Funny Thing Happened on the Way to the Forum, a musical that I'm figuring has never been staged in a venue where people were instructed to refrain from prolonged applause. The quiet edict is out of respect for the Villa's Pacific Palisades neighbors who obviously don't take kindly to amplified music or screams rattling their windows a few nights a week for four weeks out of the year. While attempting to replicate the stylized entertainment of the period, the Troubies do keep down the volume. Alas, in this instance being a good neighbor is at the expense of giving the audience a good time. An already flimsy vehicle like Mostellaria (in a translation by Kenneth McLeish and Michael Sargent) needs all the help it can get, and with no high-wattage goofiness to kick this party into gear, the evening is deadly. It's never a good omen when you're cracking fourth-wall-breaking yuks about how there are still four pages left to go in the play. Whether they feel the weight of the venue's rules or not, director/adaptor Walker and his fellow Troubies don't have their A-game this time. Haunted House Party is largely drawing its unamplified music from a mishmash of 80s songs. Any song with the word "house" in the title will probably make it into a number, whether it originated from the Talking Heads, Madness or Crosby, Stills and Nash. We haven't heard anybody outside of a karaoke bar take a stab at Tommy Tutone's "867-5309-Jenny" for a while either. The house at the center of Haunted House Party belongs to the wealthy Theopropides (Michael Faulkner) who zips out of town for several years leaving his son Philolaches (Nicholas Cutro) behind to bring in a bunch of slave girls and party like it's, er, 179 BC. The wily slave Tranio (Matt Walker) ramps up the revels and the cover-up when Theopropides arrives home unexpectedly. Philolaches has bought the freedom of a slave girl Philemateum (James Michael Lambert) with whom he is in love. That's a curious attraction, seeing as how the "lady" is correctly described as resembling a cross between Gene Hackman and Amy Winehouse, but apparently the heart and loins want what the heart and the loins want. Eventually someone dreams up a ruse to convince Theopropides that his house is haunted. In the spirit of strolling street theater, Haunted House Party contains pre-show music and entertainment. When the show has wrapped up, the players dexterously pack up the bulky Conestoga wagon-like vehicle that serves as the centerpiece of Christopher Scott Murillo's set and roll themselves off. Alas, it's a sad day when the classiest thing about an evening with the Troubies [why the apostrophe]is their exit.